...and the dynamic neighborhoods of the South Bmore Peninsula, from Fed Hill to Locust Point. Whatever nickname you choose to use, our section of Baltimore encompases neighborhoods from the Inner Harbor and Federal Hill, east to Locust Point and Fort McHenry, south to Port Covington and west to "the stadiums." There is something for everyone, from museums and art galleries to Major League sports teams along with a great mix of dining and shopping. Online since 1999, SouthBaltimore.com is your resource for South Baltimore and the Inner Harbor. You can live, work, shop, eat and play right here. Go Ravens and Orioles! And don't forget the Steamed Crabs! Baltimore Directory: What's here? What would you like to see? At A Glance - A brief introduction. Find a place to stay (Lodging): Hotels - Availability, rates, reservations on-line. Go shopping in our community - Retail stores, Cross Street Market, Southside Shopping Center. Learn to pick Steamed Crabs - SOBO's favorite! Go boating - Nautical info - a "peninsula" is surrounded by water. Vacation in Ocean City - Rent a room on-line, have a great time, see hundreds of pictures in Baltimore's favorite resort town. Add Your Business listing - FREE - Be in one of our directories at no charge. Click & See the sights from above. 21230 T-Shirts - Unique gift for a SOBO friend. Large variety. Finding a Job - not specific, just ideas. Click for a City Panorama. 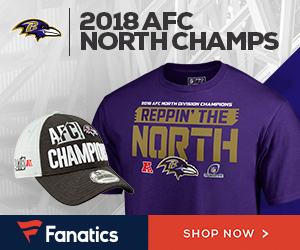 Browse these: CLICK for ORIOLES TEAM GEAR or CLICK for RAVENS TEAM GEAR. Search our series of Baltimore Websites. Much like the rest of the Mid-Atlantic, Baltimore experiences all four seasons. Keep in mind though that since it's on the water, the Chesapeake Bay, the weather can change often. Spring is a great time to visit Baltimore - not only for baseball games at Camden Yards, but for the picturesque scenery. Baltimore plays hosts to several festivals and events year-round. One of its major tourist attractions is the Preakness, the "second jewel" of horseracing's Triple Crown. This event takes place in May and draws a huge crowd. The city holds many waterfront and neighborhood festivals during the summer as well, including Artscape, a three-day event honoring the arts. Average temperatures in the spring and fall are a mild 50 to 60 degrees. In winter, temperatures aren't known to drop much lower than 30 degrees, but occasional snow is possible. Summers tend to be very hot and humid, with average temperatures in the 80s and 90s. Most visitors to Baltimore choose to tour the city in a car. It's fairly easy to navigate, given its many alternating one-way streets. Parking can be rather expensive, especially if you're downtown. If you're planning to travel from the Inner Harbor to areas north, it's wise to take a cab. You can find taxis at most major hotels, the train station and scattered throughout the Inner Harbor area. For those staying in downtown Baltimore, the Metro offers limited service. Don't depend on it as your sole source of transportation. If you're heading into the suburbs or BWI Airport, the Metro is great. It also makes stops at Camden Yards, Penn Station and Mount Washington. If you're staying in a downtown Baltimore hotel during the spring or summer, rates will be higher higher than during the "off season." The Inner Harbor is more expensive than other parts of Baltimore, but you should be able to find some bargains. Less expensive than the nation's capital, Baltimore won't break the bank. Annapolis: Annapolis is one of the oldest cities in the country. The U.S. Naval Academy was established there in 1845. Visitors to Annapolis will enjoy the waterfront festivals that take place each summer. Annapolis is known as a boating community, with tours, cruises and even sailboat rentals available much of the year. Annapolis is less than an hour south of Baltimore by car. Ocean City: If you have a little extra time to play or go on a day-trip, head over to Ocean City. About two-and-a-half hours east of Baltimore, this vacation spot is best suited for an overnight getaway. The resort town is an escape for Baltimoreans. Deep-sea fishing, windsurfing, sailing, cruising the boardwalk, or just lounging on the beach are favorite pastimes here. Washington DC: The nation's capital is just 35 miles away, easily accessible by train or by car via the Baltimore-Washington Parkway. Take a day to explore the White House, the Mall, the monuments, the Smithsonian Museum(s) or the National Zoo. If you're planning to drive to D.C., keep in mind that rush hour will tack on at least an hour to your commute.